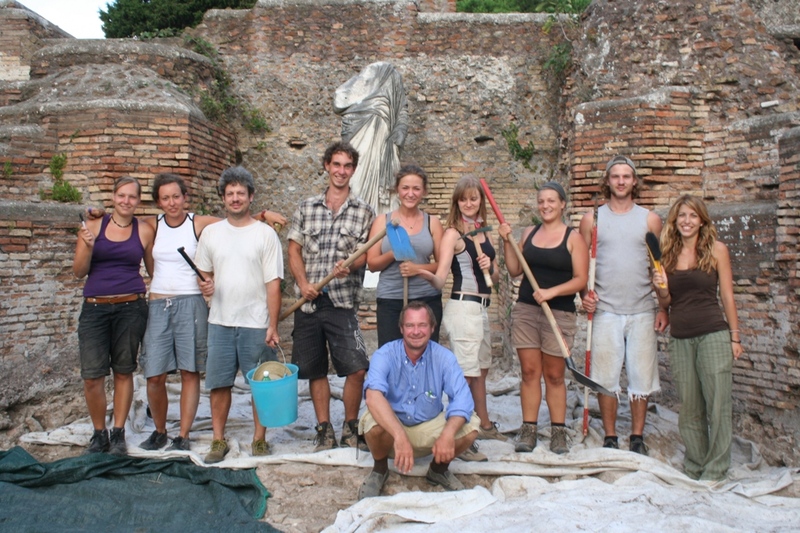 Two weeks ago the German team finished excavation work on the south portico of the main Forum on schedule: the portico’s central apse thought to have been 2nd century proved to be a late antique nymphaeum with a statue in Greek dress. There were three different types of pavement, thin layers of the 2nd century pavement and two late phases similar to the macellum-slab-area discovered last year: a late fourth and a fifth century extension, with a basin wall and a late drain onto the forum. The portico’s slabs and back wall show several phases and can be dated by evidence of more than 25 coins mostly found underneath the slabs. Some of these coins also were included in the mortar of the late construction (Pictures of apse as part of portico see below). The areas lately discovered showed also evidence for the destruction of the late-antique portico. An oil-lamp of late 5th or 6th century was found in a destruction level with roof tiles and broken slabs. But the portico seemed to have remained in use even after its destruction: The team discovered remains of early medieval floors, made from compressed earth with lots of roof tiles, glass, ceramics and 5th century coins. What was also interesting was flipping over and measuring the slabs to document their original architectural decoration: More than 1/3 of the slab area was reused from only one monument, the temple of Roma and Augustus. Only this temple wasn’t built with bricks and concrete, but in pure marble, so the provenance of our massive slabs can be proved beyond doubt. The Roma and Augustus marbles were exclusively used for the 5th century repair of cisterns (dated by Honorius/ Arcadius coins). These slabs lay next to the back wall (picture: grey stone), while the white pavement of the 4th century was more regularly laid out and consists of not reused material (dated by a terminus post quem of Constantine). So we have a clear terminus for the destruction of the biggest Temple dedicated to the Imperial cult in Ostia at or after the times of Honorius. 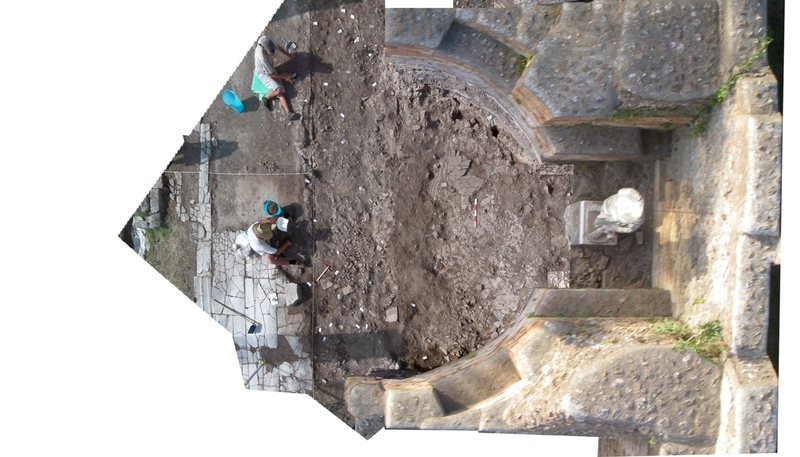 The team dug with maximum motivation continuing within and north of the apse which turned out to be almost completely decorated with spolia-marble of many colours: pink, green, yellow, white and contrasting dark serpentine on the walls: In Late antiquity strong colour contrasts were fashion, obviously even more than in the 2nd century phase!